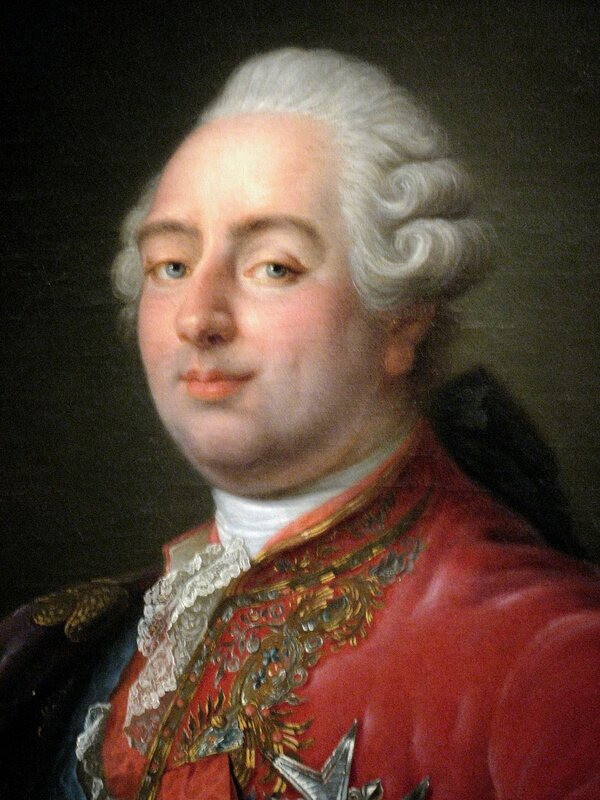 In contrast to Louis XV, Louis XVI did not like cats, nor indeed pet animals of any kind. I suspect he was uncomfortable with the effusive affection and playful reverence lavished by bored courtiers on cats and lapdogs. A couple of anecdotes come down to us about Louis's unfortunate experiences with the various felines which roamed unchecked in the corridors and apartments of Versailles. The first episode involved the beloved pet of the comtesse de Maurepas, who, like Louis XV's cat, gloried in the name of Brillant. Louis XVI managed to kill this cat while taking careless potshots at caterwauling moggies on the roofs of Versailles. (In a slightly less probable version, he delivered it a mortal blow with a hammer). One may balk at the idea of shooting cats for sport but, as the sympathetic duc de Lévi noted, Louis's character was most revealed by his clumsy but sincere attempts to make amends to Brillant's bereaved mistress. His discomfiture contrasts with the ironic enjoyment of the comte de Maurepas who treated the cat's demise with mock solemnity and derived great amusement from embellishing the story of Louis's misdemeanour. [ There was] a histoire bouffonne which the comte de Maurepas had composed, or at least embellished with ridiculous details, on the death of Madame de Maurepas's angora cat. This beloved animal had been killed by the king who, in his frequent patrols across the immense terraced roofs of Versailles, was in the habit of amusing himself childishly by [hunting cats]. M. de Maurepas recounted the anecdote among his close associates; what struck me most was the sorrow the good prince expressed for having upset Madame de Maurepas and the trouble he went to to replace the defunct cat. Pierre Marc Gaston, duc de Lévis,Souvenirs et portraits 1814. The story also appears, with variations, in the memoirs of the vicomtesse de Fars Fausselandry, who frequented the society of the duc de Brissac in the 1770s and '80s. The comtesse de Maurepas's pet cat was one of the most considerable and well-considered personages of the Court. 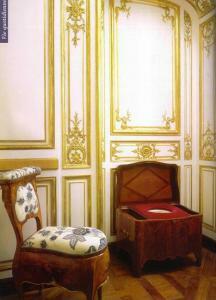 He had his own particular entourage, composed of the most illustrious figures at Versailles. His name was Brillant; he was an important person. One inquired after his health and talked about him as though he were a Prince of the Blood. He would sit next to his mistress on a sumptuous red embroidered cushion, where he would receive the homage of his courtiers with a noble nonchalance. In spite of his grandeur, Brillant was a cat like any other, and love remained for him the first necessity in life. As with the late King, whatever measures were taken, however great the trouble to accommodate his capricious affections, he was never satisfied; sometimes My Lord the Cat became again a simple moggy. He would abandon the pomp of the comtesse de Maurepas's apartments, and like the commoners of his species, would prowl the attics, the garrets and the gutters. It so happened that his amorous wanderings led him to a room on the top floor of the chateau where Louis XVI had set up a locksmith's workshop Whether by chance or by preference, Brillant took to enjoying his pleasures there. His frolics caused disorder; the king was aware of them; One day it happened that the king entered the workshop unexpectedly and the Maurepas cat was unable to escape in time. Louis, who didn't recognise him, delivered him a blow with a hammer and killed him stone dead on the spot. It was a stormy period in history. There were revolts due to the high price of bread and preparations were being made for war with England, all of which must have created grave worries for the Minister of State Jean Frédéric Phélypeaux de Maurepas. But great political events caused him less trouble, regret and difficulty, than the task of telling his wife of her cruel loss and consoling her in her grief. The comtesse de Maurepas filled the palace with her cries and made tearful complaints about Louis XVI's barbarity. Courtiers who had come to give their condolences found themselves in an awkward position. The king sent the baron de Breteuil as his ambassador to attempt to appease the comtesse; the monarch was no less pleased by his diplomatic skills on this occasion than he was by his negotiations with Vienna. 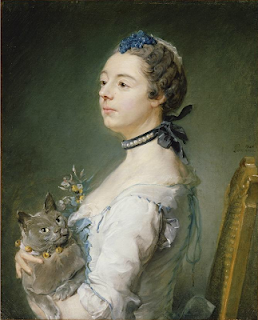 No-one spoke of anything for a week but Madame de Maurepas's cat. M. de Breteuil was rewarded for the success of his mission with a full-length portrait of Brillant, which the comte de Maurepas presented to him with considerable ceremony. The baron placed it in the most conspicuous position in his apartments where it remained until the first minister's death. One day the King was seated on his throne - not the throne where he received solemn embassies or rebuked rebel Parlements, but the throne which was the responsibility of the porte-chaise.. In his hurry, he didn't notice an enormous Angora cat which had curled up peacefully in the porcelain bowl to enjoy the solitude and cool. For a time, the animal remained unperturbed; deprivation of air did not disturbed its snores. But suddenly, without warning, kitty became well and truly frantic, demonstrating its discontent by extraordinary efforts to escape from its uncomfortable position. The king was unnerved and surprised by this veritable close assault; he too immediately took flight, holding up his stockings and running about ringing bells. The captive meanwhile, in a pitiful panic, broke porcelain and vases in its attempt to find the way out; an escape was promptly offered to it. This anecdote, which I guarantee to be true, would not have amused Louis XVI who didn't like cats. In this, as in many other things, he differed from Louis XV who always had his cat on the mantlepiece where it would be provided with a velvet cushion to protect it from the cold of the marble. How good it is to see a genuinely scholarly artile dealing with The Cat during recent centuries. This is a very good article indeed, full of information not found in other websites claiming to do "History of the Cat" Very well done.